We provide professional graphic design work that ensures you always get outstanding Awards. We'll send you an art proof to sign off on before producing your Awards. This Award Comes in Quality Presentation Box. The price you see is the price you pay. It includes quality engraving (etching) of 1 logo, up to 8 lines of text and some creative design elements. We pride ourselves in ensuring your get great design work. 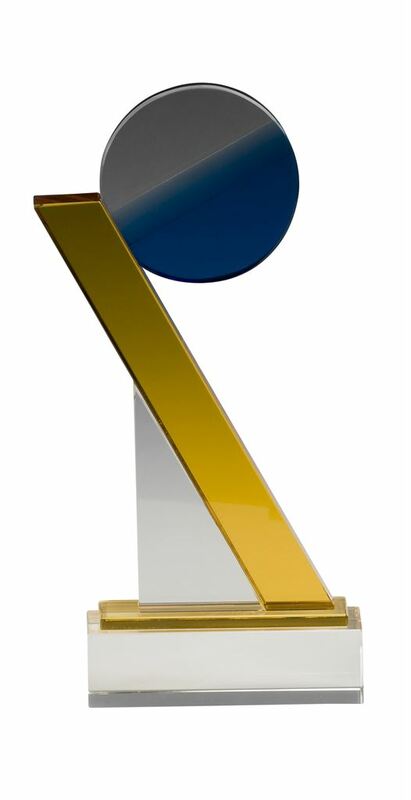 Some Awards have Imprint options such as Etch and Colour Paint Fill or Full Colour Print. When you select any options available the price will automatically adjust to the correct price for the chosen options. Your Logo set up is FREE if you provide us with a Vectorised EPS file, Vectorised .AI file or Corel Draw file. Most Crystal and Glass Trophies get etched and have a lovely sharp frosted look to them. We can also optionally colour fill logos and text (see Imprint options on the product page) If specific PMS colours are required there is a small PMS colour matching fee involved as a one off. if you would like colour match please provide us with your specific PMS colours. Our Crystal Trophies range and quality of work is second to none. Our creative team will ensure professional graphic artwork and will add accents to the design to make it exceptional for your winners. Crystal Trophies come in a nice presentation case to protect and complete your awards. Our graphics department want to give you more than logo above text and will strive for innovation by taking elements of your logo to create accent elements, making the award design more alive. You’re not a number here; we take on your project with creative vigor. Just take a look at the examples on our website. How we imprint your Crystal Awards. Whilst others succumb to using laser engravers to engrave Crystal Trophies which produces a duller, rougher, inferior finish we uphold the value and importance of your awards and use Sand Carving to engrave your Crystal Awards. This produces a crisp, bright superior engraving that enhances your Awards and makes what we do something to be proud of. Read More about the difference between lasered crystal and Sand Carved Crystal. We give you the quality that Tiffany Crystal insist on. We use world class Mimaki digital printers for print work ensuring rich full colour imagery and we can match PMS colours. We don’t guarantee exact match but we do come very close. We can optional engrave or print on multiple sides to create interesting visual effects at additional charges. We can also combine both laser engraving and digital printing on the one trophy. Pricing is based on 1 logo and text (and a bit of accent element work). Excessive text or multiple logos may add to the final cost of your awards. Some Trophies can’t be Colour Printed. Some of the standard range trophies with an crystal base can’t be colour printed and are only offered with sand carving (quality etched). We mention this on the product page. Well actually we can add colour elements to these trophies if you really want it. For those marked Quality Etched Only you’ll have to talk to us and twist our arm to come up with a special colour imprint. Packaging is mentioned on the product page. Crystal Trophies all come in presentation boxes with satin or foam lining depending on the range. How the production process works. Once you have made payment and provided all logos and details our graphic team will create the layouts and send to you for approval. So, yep, you get to see what we are going to do before we do it. We can accept up to two change requests to the design work before we need to add small extra art charges. Once you sign off on the artwork we’ll get stuck into it and get your order ready in the specified production days. What you need to give us regarding logo file types. The better the logo the better the imprint. If we are engraving we need vectorised eps files. If we are printing we prefer vectorised eps files too, but a high resolution Jpeg will do in some cases. See our full artwork requirements in the About section of our website. At Premier Awards we use only the best form of crystal engraving to ensure you get absolute quality workmanship befitting of your recipients. We can Etch any image, logo and text. The pricing for this item is set to include Quality Etching. By changing this option the prices will reflect the price based on the chosen option. If you select this option we will provide full vivid colour digital print your logo, graphic and text. We can use state of the art digital printing equipment to produce high quality professional print work. We can come very close to PMS colour matching. If you wish to have close colour matching please let us know the colour PMS or CMYK labels for your colours. By changing to this option the prices will reflect the price based on the chosen option. When you select this option we will digitally print some of the imprint and Quality Etch other parts. You may like the look of the sand blast etched finish but want your logo or image in colour. If so this is the option for you. Sometimes when 1 colour is required in combination with etching we will etch the entire work and colour fill the area to be coloured. The ribbons you supplied for our carnival are beautiful. It’s the first time we have used personalised ribbons and couldn’t be happier. The children will feel very special receiving a quality place ribbon with the school logo on it. Thank you for your prompt and efficient service. I just wanted to say a HUGE thank you for all of your help with getting these plaques made in such a short time frame. I really appreciate it!! Thank you Premier Awards. Your attention to detail along with amazing service has resulted in another successful soccer presentation !!! Many years and counting.